Jazz, like the country of its birth, is forever a dazzling work in progress. The genius of that progress for more than six decades, improvisations, reinventions and all, is embodied in Dave Brubeck’s music. He helped ease jazz into the mainstream, married spontaneity with classical rigor, made unlikely time signatures irresistible, and he made very serious music swing. 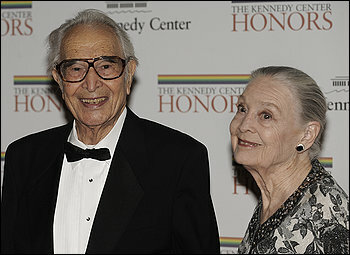 From the Dave Brubeck Quartet’s worldwide success in the 1950s and ‘60s, right through the jazz opera Cannery Row Suite he created with his wife Iola Brubeck at the 2006 Monterey Jazz Festival, and Brubeck’s piano solo prowess at the 2008 San Francisco Jazz Festival, the man continues to surprise. He has set to music the words of the Old Testament and of Martin Luther King, Jr. He has created the sounds of Peanuts in the miniseries This is America, Charlie Brown. He has inspired choreography by Lar Lubovitch, Murray Louis and other visionary dancemakers. His “polytonality and use of polyrhythms, combined with his uniquely American musical language,” noted The New York Times, “give his music an unmistakable and accessible sound.” Crowned “the reigning elder statesman of jazz” by the Washington Post and designated nothing less than a “Living Legend” by the Library of Congress, this octogenarian icon of West Coast cool remains impossibly young. That’s jazz for you. ”As Darius Milhaud said,” Brubeck told The New York Times recalling his mentor, “if you come from America and haven’t felt the jazz influence, then you haven’t written music that expresses America.” Dave Brubeck, unmistakably, irresistibly, writes American music. David Warren Brubeck was born in Concord, California in 1920 into a musical family. He began piano lessons with his mother at the age of 4 and by 14 he was playing local gigs on weekends. He enrolled in the College of the Pacific in Stockton, where he met his future wife, fellow student Iola Whitlock. After graduation in 1942, he enlisted and served in Patton’s Third Army in Europe. After the war, the young veteran enrolled in Mills College in Oakland, studying composition with Darius Milhaud. It was the jazz-loving French composer and adopted Californian who encouraged Brubeck both to pursue a career in jazz and to incorporate jazz into his compositions. 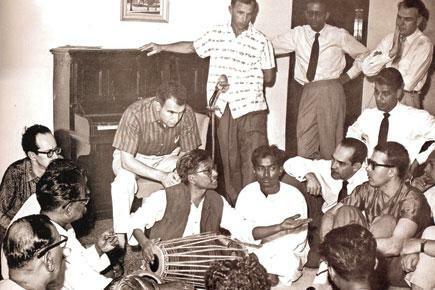 The first Dave Brubeck Octet, a musical gathering of Milhaud’s students, was formed in 1947. In 1949, with Octet alumni Cal Tjader and Ron Crotty, Brubeck made the first of a string of award-winning Dave Brubeck Trio recordings. 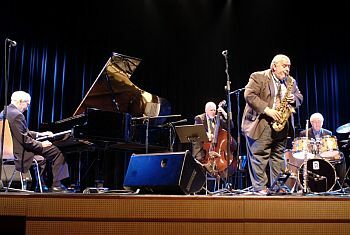 He teamed up with the saxophonist Paul Desmond, another octet alumnus, in 1951, beginning a collaboration that would influence jazz for an entire era. With Eugene Wright on bass and Joe Morello playing drums, Brubeck and Desmond played college campuses and concert halls, introducing cool jazz to a post-war generation, and touring with such giants as Ella Fitzgerald, Duke Ellington, Charlie Parker, Dizzy Gillespie and Stan Getz. Brubeck’s portrait appeared on the cover of Time in 1954, with a story about the rebirth of jazz and the Dave Brubeck Quartet’s popularity and heralding Brubeck as the leader of “the birth of a new kind of jazz age in the U.S.” Sponsored by the State Department, the Dave Brubeck Quartet began touring internationally in 1958 and took American jazz to Poland, India, Turkey, Sri Lanka, Afghanistan, Pakistan, Iran and Iraq. Their recordings made musical history: Time Out in 1959 declared jazzy independence from the traditional 4/4 rhythm, giving birth to the now classic 5/4 time “Take Five,” the 6/4 “Pick Up Sticks,” and the disarmingly fresh “Blue Rondo a la Turk” in 9/8. Composed by Desmond and boasting dry and witty banter between the soloists, “Take Five” began turning up in jukeboxes all over the world. Time Out became the first jazz album to sell more than a million copies. Now in the Grammy Hall of Fame, it remains one of the best-selling jazz albums of all time. Even as he continued to explore the intimate possibilities of his Dave Brubeck Quartet, the composer followed Milhaud’s advice and expanded classical music’s horizons with jazz. He recorded Dialogues for Jazz Combo and Orchestra with Leonard Bernstein and the New York Philharmonic in 1959, and in 1960 he composed Points on Jazz for American Ballet Theatre. He began a fruitful association with the Murray Louis Dance Company. He composed the musical theater score The Real Ambassadors for Louis Armstrong and Carmen McRae, who made it a hit at the 1962 Monterey Jazz Festival. 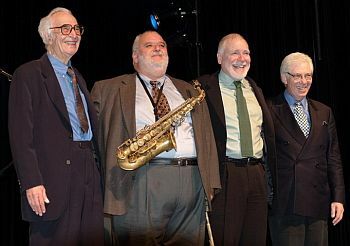 As his family grew, Brubeck performed with his sons Darius, Chris, and Dan, billed as “Two Generations of Brubecks” and boasting the saxophones of Desmond and Gerry Mulligan as guests. The Cincinnati Symphony Orchestra premiered Brubeck’s oratorio The Light in the Wilderness in 1968 and soon afterwards his cantata The Gates of Justice, a setting of words by Martin Luther King, Jr. President Johnson invited Brubeck to play at a state dinner for King Hussein of Jordan, and the jazz master soon became a familiar player at the White House for many administrations. He accompanied President Ronald Reagan to Moscow and played for the Reagan-Gorbachev summit in 1988. A devout Catholic, Brubeck composed Upon This Rock for Pope John Paul II’s visit to San Francisco. His mass To Hope! A Celebration, has been played in Vienna’s St. Stephen’s Cathedral and in Moscow with the Russian Orchestra. On April 8, 2008 Secretary of State Condoleezza Rice presented Brubeck with the Benjamin Franklin Award for Public Diplomacy for offering an American “vision of hope, opportunity, and freedom” through his music. He is America’s cultural ambassador in the best sense, a musical messenger of optimism and hope, of the freedom that is jazz itself. 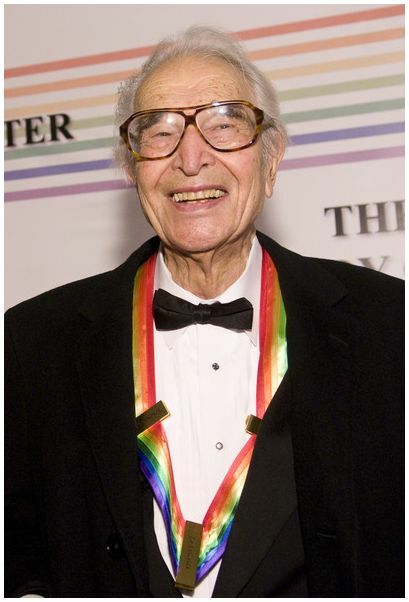 Brubeck grins widely, rests his huge hands on his knees. Of course there is no way to stump this piano player. The man has been performing and composing, improvising freely across genres for some 70 years, mixing jazz with sacred and classical forms, recording hundreds of times, with his original quartet, whose 1959 “Take Five” improbably became the first million-selling jazz single of all time; with his own sons; as a soloist and with chorales and full orchestra. He continues to compose with urgency, scribbling on manuscript with pencil. With his son Christopher, he’s tweaking the score for a multimedia work about the photographer Ansel Adams that the Baltimore Symphony will present in February; there’s also some piece for 20 cellos.